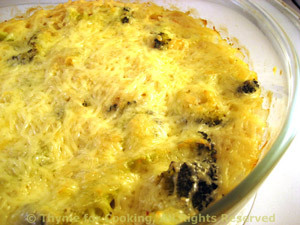 Broccoli and Brown Rice Gratin, Thyme for Cooking easy winter side dish. Trim broccoli and cut into small florets, with some stem. Mix rice, onion, stock, herbs and ricotta. Put the rice mixture into a baking dish. Arrange the broccoli over the rice, pressing it down firmly. Cover and bake, 400F (200C) for 30 minutes. Uncover, sprinkle with cheese and bake 5 minutes longer, uncovered.